A man has been jailed after he racially abused workers at the McDonalds in Crawley town centre. Patrick Maughan, 56, of Perth Close, Langley Green, pleaded guilty to two counts of racially aggravated behaviour which caused harassment. 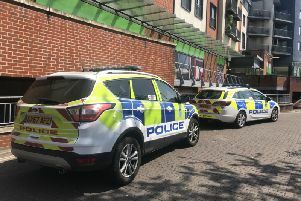 Crawley magistrates on Wednesday (September 2) heard he committed the offences six days after he was given a community order for a racially aggravated assault at Crawley Cineworld. Melanie Wotton, prosecuting at Crawley Magistrates’ Court, said Maughan entered the restaurant at around 7pm on June 18. The court heard he racially abused a man working behind the till and a security guard as he left the premises. Julia French, defending, said Maughan was an alcoholic. A probation officer said Maughan had a ‘very poor compliance’ with his community order requirements following the attack at the cinema. Magistrates jailed Maughan for 12 weeks. He will be put on a 12 month community supervision requirement after. Maughan was told to pay £180 criminal courts charge and £80 victim surcharge. Chairman of the bench, Maria Kempshall said: “The offences are so serious that only a custodial sentence can be justified. “It was harassment of a racial nature. “The two people were carrying out their employment in a public place. “It must be noted that this is the second similar racially aggravated offence in a short time span.